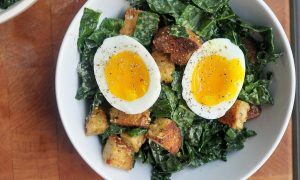 We eat this kale salad in our house constantly and I’m always looking for new ways to enjoy it. 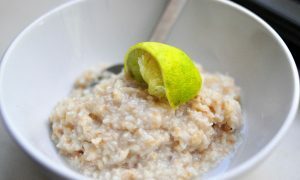 If you have been over for a meal chances are you have tasted some version of this thing. It’s more or less the Kale Salad from Good and Cheap. It’s great just as is, but lately I’ve been making additions to it, like adding roasted squash, sliced pickles, roasted cauliflower, olives, whatever! This week I tried adding a soft boiled egg, and it might just be the best thing yet. 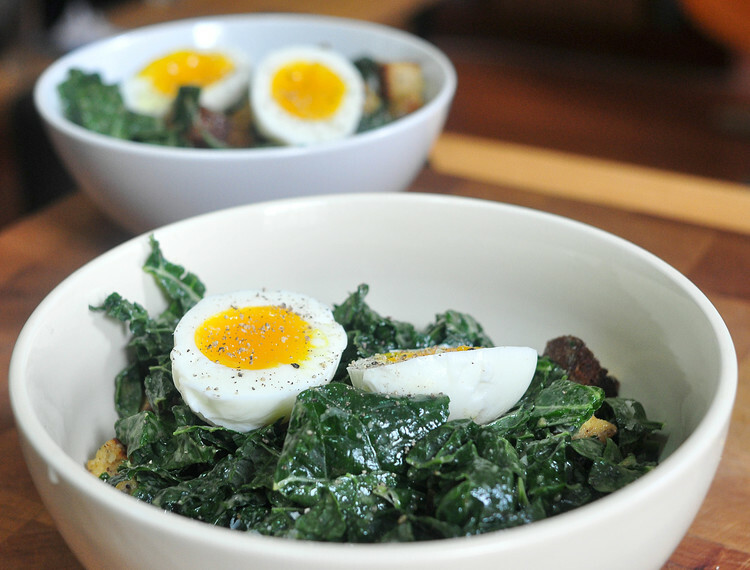 Adding an egg instantly turns this into breakfast salad. Throwing an egg on top of basically anything is usually a great idea. The problem with throwing a hot fried or poached egg over salad is that it wilts your greens. No good. A soft boiled egg solves this problem. 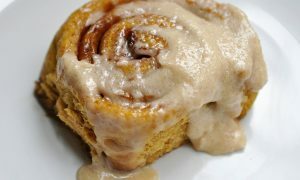 It is cool, but you still get all the gooey yolk goodness. Salad for breakfast sounds weird, I’ll grant you. But with eggs, toasty croutons, salty Romano, tangy, bitter greens and rich dressing it’s almost like a deconstructed kale version of eggs florentine. 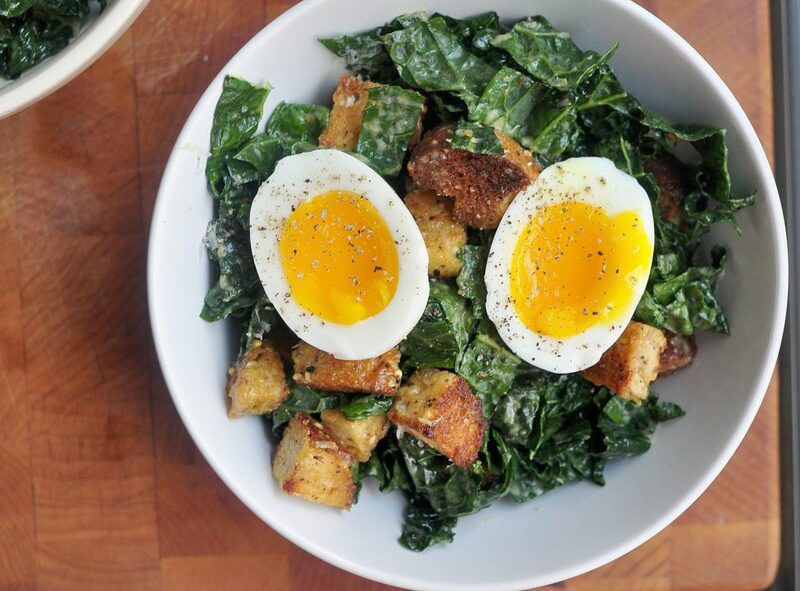 A twist on a Kale Caesar salad with soft boiled eggs on top. 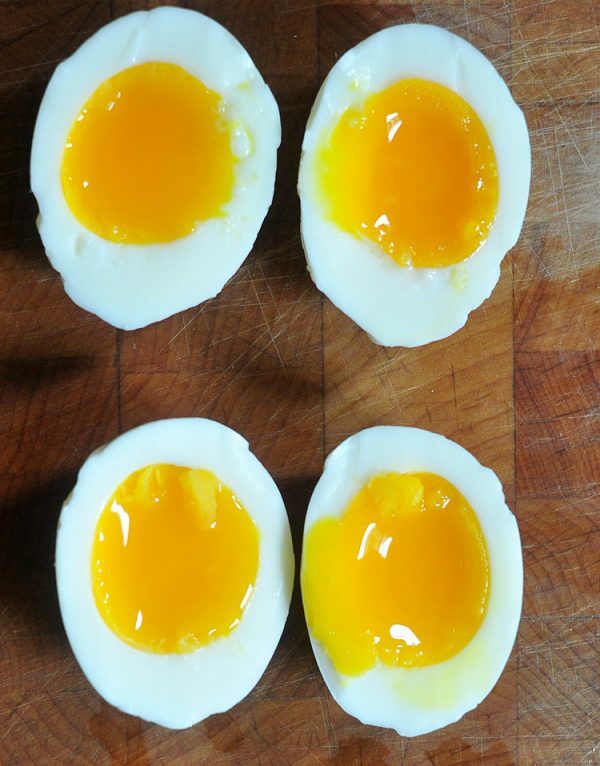 Place eggs in a pot and cover with cold water (I'd recommend making more than 2 and having the others for snacks during the week) and bring to a boil on medium high heat. Once the the pot begins to boil, turn off the heat and cover the pot with a tight fitting lid. Set a timer for three minutes. Once three minutes are up, pour out the hot water from the pot and run the eggs under cold water. Let them sit in the cool water for 10 minutes. 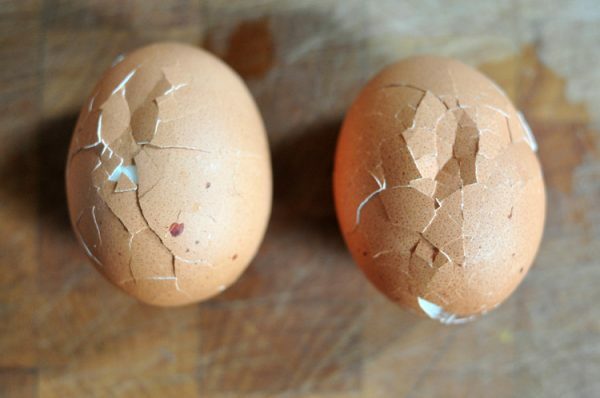 To peel the eggs easily, roll the eggs around on a countertop, gently cracking them all over. 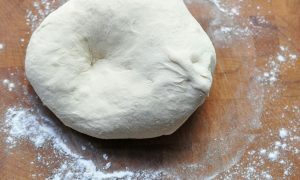 Starting at the bottom of the egg gently but confidently peel the crackly shell. It should come off in one large piece, but of course that's not always the case. Once they're peeled, carefully slice them in half and sprinkle them with a little salt and pepper. For the salad, melt the butter in a large pan on medium heat until just sizzling. Add the bread cubes. Let them cook until brown on the underside, then flip them. Add more butter as needed to keep the bread nice and toasty. Cook until all sides are brown, but don't worry about them being perfect. While the croutons are still hot, sprinkle them with salt and pepper. Set aside. To make the dressing, start with the egg yolk in a large mixing bowl. Add the lemon juice, mustard and hot sauce. Whisk briskly until it is light and frothy. Slowly add the olive oil, whisking the whole time. Once everything is incorporated, add the salt and pepper, then adjust to your taste. I tend to like it very lemony. Once you have made this once you won't need to measure, just eyeball everything. Grab the tough spine of each piece of kale with one hand, then with the other hand clasp the bottom of the leaf and pull up quickly to remove the spine. If some of the spine is left in it's not a problem, but it is tough, so you want to get rid of most of it without sacrificing your tasty leaves. Slice the leaves in half lengthwise, then cut into thin ribbons. Cutting the leaves into thin ribbons will disguise its naturally tough texture. Add the kale to the bowl and toss to coat it with the dressing. Set aside for 10 minutes or leave in the fridge for a few hours. 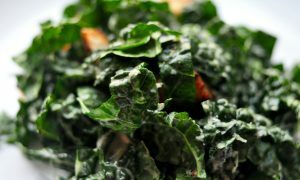 The kale will become more tender if it marinates in the dressing for a while. Before serving, add the croutons and grate some romano over everything and toss. Then nestle the eggs into the top.